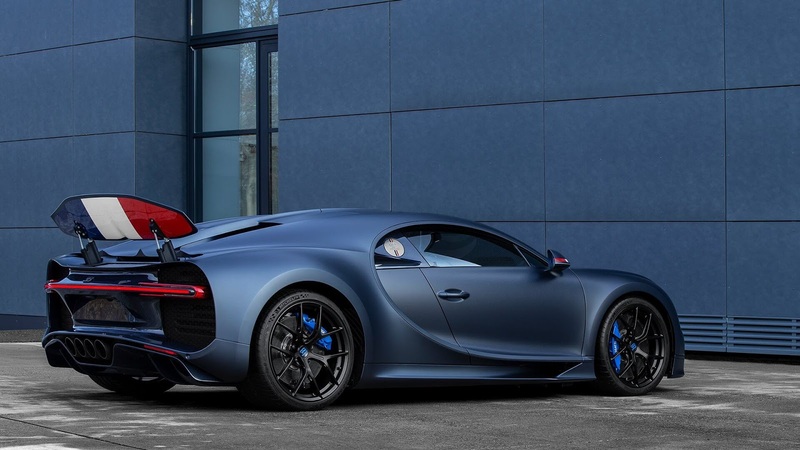 Bugatti have marked the 110th anniversary of the company’s existence with an immaculate special edition of the Chiron Sport, labelled the “110 Ans Bugatti”. A mere 20 units of this special edition Bugatti will be produced, making them extremely exclusive and highly sought-after among supercar enthusiasts! Official images were revealed on February 7th, showing off a beautiful matte Steel Blue model that unmistakably pays homage to Bugatti’s French roots and the luxury models from the 1920s. 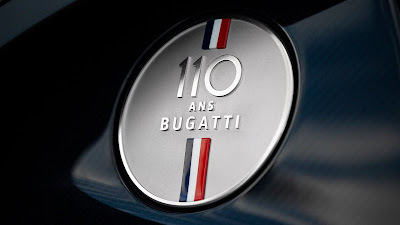 With the mechanical performance of the incredible Bugatti Chiron Sport, a deluxe exterior and a striking interior to match, the “110 Ans Bugatti” is an excellent celebration of the 110th birthday of the first ever Bugatti – the Type 10. The first car ever created by Ettore Bugatti was the Type 10, which made its debut way back in 1909 – hence the “110 Ans Bugatti” name of this special edition, which translates to “110 years of Bugatti”. At the time, the purpose of the Type 10 was to be a light, powerful and nimble form of transport –not only to match the competition but to surpass it in every way, a goal that Ettore could accurately apply to today’s Bugatti models. In terms of its appearance and being light and small – the Bugatti “110 Ans” is not necessarily similar to the legendary Type 10. The new special edition is hardly light and not very small at all, but it sure is powerful, generating a jaw-dropping 1,479bhp. It may be unsustainable for such a powerful machine as the Bugatti Chiron “110 Ans” to maintain the ‘light and nimble’ characteristics obtained by its predecessors, but with engineering mastery, the power of this new special edition Bugatti certainly does the company’s creator justice. Bugatti’s new special edition Chiron Sport pays an obvious tribute to how proud the company is of its French heritage, with a blue theme throughout and the iconic Tricolour appearing all over the vehicle. Bugatti President Stephan Winkelmann referred to the importance of their roots in Molsheim, in the Alsace region of France, stating that France was not only a monumental part of the company’s past but also the planned location for their future. It’s also worth noting that the luxurious two-tone colour scheme is a purposeful feature in reference to the pioneering models during the 1920s. 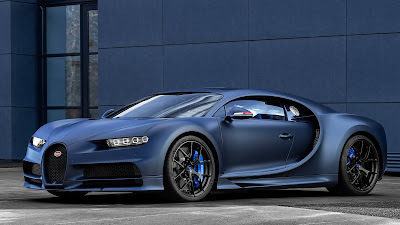 Bugatti’s “110 Ans” special edition version of the Chiron Sport is distinctly representative of Bugatti as a company. Their newest model is beautifully sculpted, as we have come to expect as standard from the French manufacturer, with an added elegance provided by its matte Steel Blue paintwork. 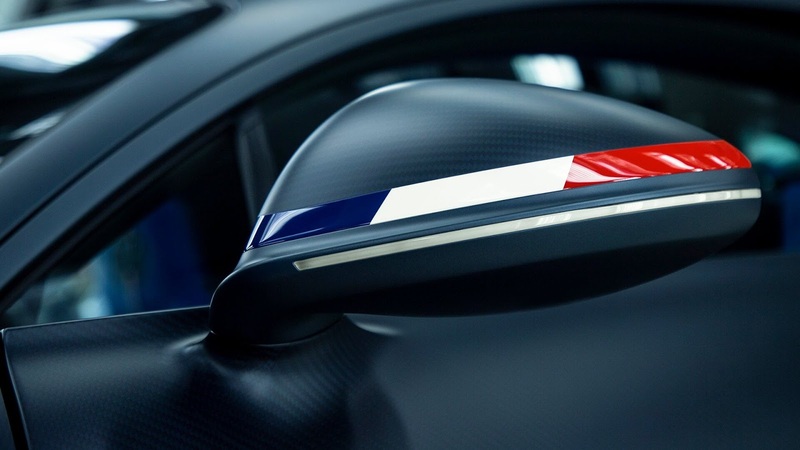 A prominent feature of the new Bugatti is the French tricolour, one of the most iconic symbols of any nation around the world, which appears numerous times on both the interior and exterior alongside the words “110 Ans Bugatti”. The “Le Bleu-Blanc-Rouge” (blue, white and red) decorates the exterior side mirrors, fuel filler cap, and (most notably) the underside of the substantial rear wing. The theme continues inside the car, with the tricolour visible on both headrests, the back of the front seats, and centrally at the top point of the steering wheel. 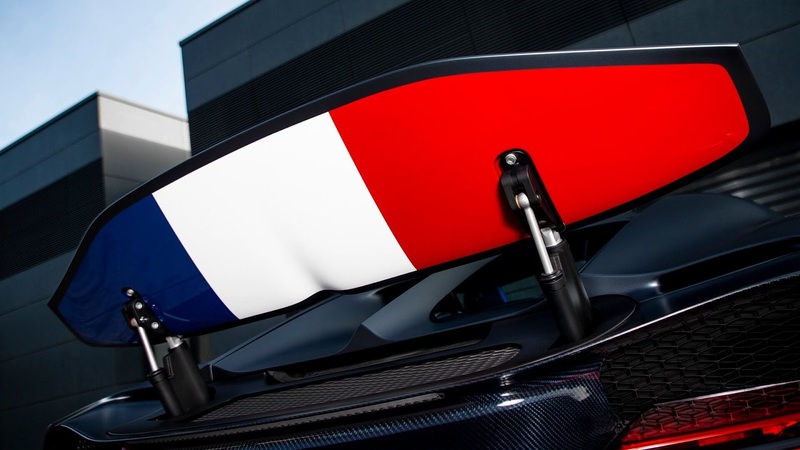 You would expect something so extraordinary and eye-catching to stand out awkwardly on most vehicles, but the tricolour seems to only complement the Bugatti Chiron. It just works. What does the "110 Ans Bugatti" Chiron Sport Look Like? The new Bugatti’s exterior is quite simply stunning to look at. Its body and front-end is matte Steel Blue carbon fibre, whereas the rear-end is overlaid with matte paintwork. Its wheels are painted Nocturne matte black, with the bright contrast of the French Racing Blue brake callipers visible through the gaps in the alloys. 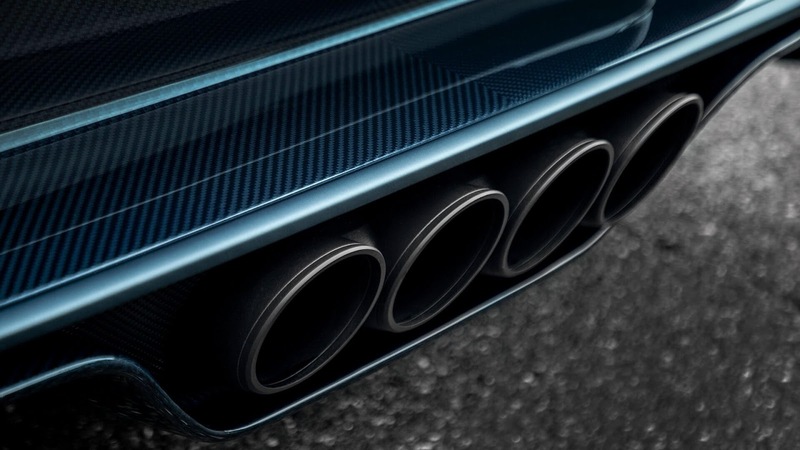 At the rear of the “110 Ans Bugatti”, a distinct diffuser is finished with gleaming Steel Blue carbon that juxtaposes with the dark, matte black exhaust system. The sky view roof consists of two fixed glass panels above the driver and passenger’s seats, which is included as standard for these limited edition Bugatti models, but is an optional extra for standard Chiron examples. Flashes of the previously mentioned French Racing Blue occasionally appear around the exterior – including a small Bugatti emblem at the centre of the alloy – but the supercar’s true vibrancy is more obvious as we step inside. 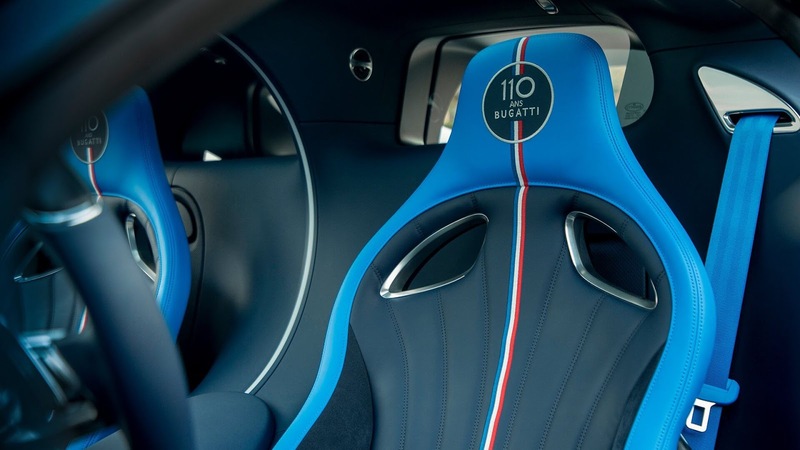 The interior of the “110 Ans Bugatti” is especially striking, with the French Racing Blue covering the headrests and seatbelts, giving the inside of the vehicle an added edge. As previously mentioned, the tricolour is expertly embroidered at the top of the steering wheel, and stretches centrally from the top of the headrest to the bottom of the seat. Bugatti certainly haven’t held back in displaying their commitment to their French roots. Bugatti have utilised Alcantara for the trim, but the majority of the interior is immersed in blue leather, with elements of carbon fibre found throughout the car for adequate weight reduction. This limited edition Bugatti is pretty much identical to the standard Chiron Sport in terms of its performance, which isn’t necessarily a downfall. With the Chiron Sport setting a 0-62mph time of under 2.4 seconds and hitting a ridiculous top speed of 261mph, what more would you ask for? As a Sport version of the Chiron, the driver will experience stiffer suspension, modified steering, and torque vectoring, among other more advanced features. The Chiron Sport’s power output peaks at 1,479bhp and 1,180lb-ft of torque thanks to its 8.0-litre W-16 engine. Per reports, the Sport version is an astonishing five seconds faster than the standard Chiron around the track, demonstrating just how dynamic and breath-taking this model really is. Where some special edition supercars fail to leave a real mark on the industry, this Chiron Sport “110 Ans” will be remembered for all the right reasons, and seems to be receiving overwhelmingly positive feedback from motor enthusiasts across the world. The model’s tribute to France is far from subtle, but the intrepid nature of the design successfully displays just how proud the company is of its French heritage. Bugatti’s Chiron Sport “11 Ans” edition is everything a special edition supercar should be – aesthetically pleasing and exclusive, with an authentic and meaningful purpose. Take a look at our other articles including reviews of supercars from Lamborghini, Ferrari, Aston Martin and McLaren. Be sure to 'Like' our Facebook page to stay up to date with the latest supercar news!